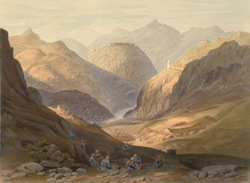 This lithograph was taken from plate 13 of 'Afghaunistan' by Lieutenant James Rattray. Rattray was part of a combined force known as the Army of the Indus. He helped man the rear-guard during the army's march from Kabul to Peshawar. The wild mountain scenery of Afghanistan suddenly surrounded them on entering the Khyber Pass from Jamrud. Their mission was to take the fortress of Ali Masjid, popularly known as the Key of the Pass, which dominated the road and was garrisoned by Dost Mohammed's troops. Rattray had taken this sketch, "and had scarcely completed it, when suddenly a report was heard, and, to my utter astonishment, walls and bastions composing the fortress blew up simultaneously in the air, like a whirlwind of sand; and so completely was it swept off from the summit of the mountain, that when the dense cloud cleared away not a vestige of the building remained."